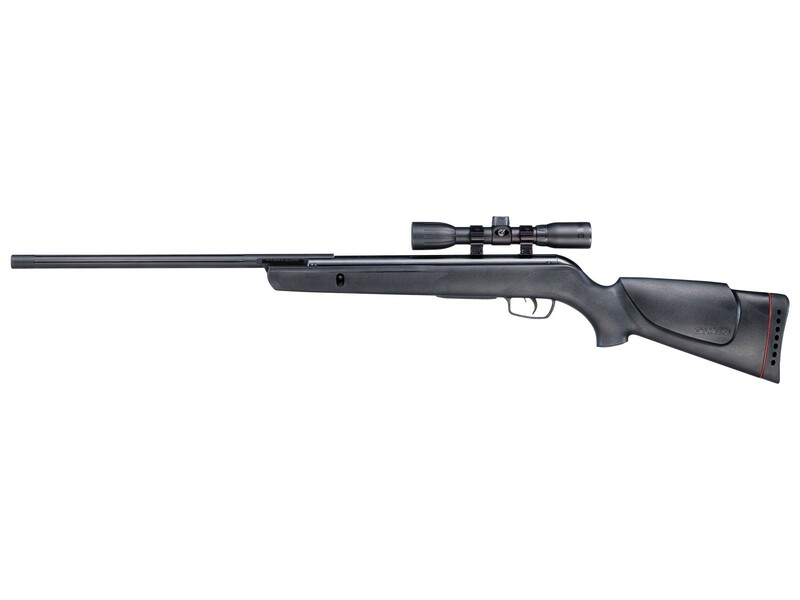 The perfect air rifle for varmint hunting, controlling pests and target shooting. The rugged synthetic stock stands up to all kinds of weather, so just mount the scope and get started! Things I liked: For the money-Great shooter right out of box.At 10 yards grouped all shots together was very happy. Easy cocking.Did clean barrel first. When attaching scope removed the rear rings only.Did not remove front rings.After attaching shot one inch high and vertically dead on. Trigger is good.Been collecting and shooting air guns for 40 years. As have said for the money good rifle. Things I would have changed: Nothing to date. Things I liked: very accurate for a spring powered rifle. Very moderate cocking effort for the achieved velocity. My Gamo Varmint is pushing 8.18 grain H&N wad cutter lead pellets at a consistent 910 feet per second. EXCELENT results. What others should know: This rifle just keeps getting better with use. I have now shot close to 1,000 pellets thru it. Several styles of pellets that it shot just O.K. when new, it now shoots them very, very good. I have a large quantity of daisy wad cutters that I bought for less than 1/2 cents each on clearance at local farm supply stores. None of my other 177 cal. guns, rifles or pistols shoot them worth a darn. Now that the Gamo Varmint is broken in, it now shoots the Daisy pellets almost as well as the high quality H&N match rifle pellets. This makes for very economical plinking. I have found a pellet that this rifle has fallen in love with. H&N Match Rifle wad cutter pellets, 8.18 grain. H&N Match Rifle, .177 Cal, 4.49mm, 8.18 Grains, Wadcutter, 500ct This pellet makes this rifle think it is a PCP. It just puts them exactly where you point the gun. This target was shot at 10 meters from a bag rest by a 68 year old guy who doesn't see all that well. Shots #1 and #2 Were scope adjustment shots dialing in the point of impact for the new pellets. This is great performance from such a moderately priced gun with a non AO scope. 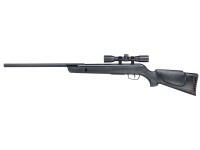 This rifle shoots many pellets moderately well. It has a very nice trigger, making it easy to shoot accurately. The safety that does not reset itself is a feature I really like especially when target shooting. I like this almost as much as my gas piston Benjamin Prowler. This is probably the easiest to shoot spring powered rifle that I own. The recoil and torque are very moderate. My rifle is in love with Winchester hollow point pellets. It puts 5 of them thru a single ragged hole at 10 meters time after time. This rifle shoots almost as well as my Benjamin Prowler. It is by far the easiest "springer" I own to shoot accurately. But it only likes the pellets it likes. Find the right one and life is good. Things I would have changed: maybe some open sights would be good but other than that, nothing! Gamo vatmint has metal or plastic trigger? I am not sure because in one hand it looks metal, but in the other hand since 2010 gamo have been using plastic trigger.. would like to know for sure if someone does. Btw is this diffetent model from the varmint hunter with the SAT? Cause I geuss it is. What is the legnth. Thanks.